Golden Retrievers have been used as guide dogs for the blind, and to assist folk in wheelchairs. They are classified as gundogs because of their instinct to retrieve game birds. Most breeders are in Gauteng, but there are a few in other provinces. Delivery of puppies can be arranged. Sharron Brown 0828307291 email, Webpage: Conkasha. Barbara Brown 082 255 1635 email barbarabrown@telkomsa.net Webpage Simaxdal. "All my puppies are sold. Thanx for your wonderful website. Jacolien Rabie, Breeder." 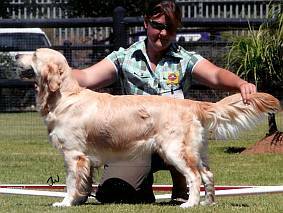 Golden retrievers were bred by crossing a Tweed Water Spaniel with a yellow Wavy Coated Retriever. Retrievers were used to fetch things for their masters. If a hunter shot down a game bird, the dog might be used to retrieve the bird and bring it to his master. Today the Golden Retriever still enjoys fetching things like balls and things we drop. This can be very useful! The origins of dog breeds. Appearance: Attractive gold or cream colour. Coat may be flat or wavy and needs brushing. Legs are feathered. Temperament: Golden retrievers are good natured, easy to train. They are large dogs who need exercise. Retrievers bring things back. God wants to bring US back when we get into trouble! Quote from the Bible, "I will bring them back. They will pass through the sea of trouble. I will strengthen them, declares the Lord." top of page. Labrador retriever puppies (other breeds) contact webmaster home advertise!